Bakwaas Trading: Totally goofed up, but the day saved me!!! Totally goofed up, but the day saved me!!! If I made a profit today, it's totally because of the market. None of the credit can go to me, because I goofed up big time today. 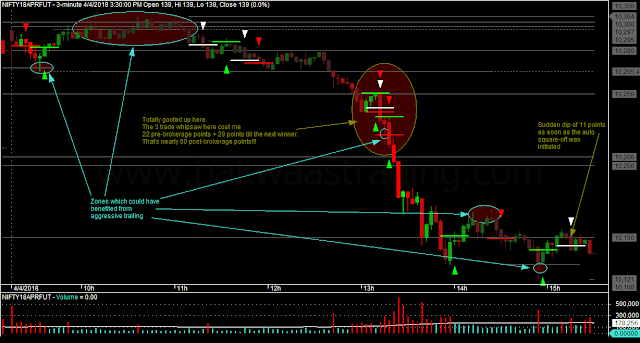 I did follow all my pre-decided trailing rules today - it were the rules that were not good enough. I have been checking my recent charts. I find that the current rules are ok for periods when the momentum and volatility are normal or low. But for periods when the momentum/volatility are high, I need a different set of rules for trailing the Stop Loss. In fact, I had already considered the rules to be applied for such periods, only I was yet to incorporate them into my pre-decided Trailing Stop rules. During periods of high momentum/volatility/volume activity, do not trail aggressively. But as soon as the momentum/volatility/volume activity returns to normal from high, trail aggressively. This rule could have kept me out of the whipsaw, that cost me nearly 60 post-brokerage points. Today, instead of following this rule, I tried to trail aggressively during the momentum/volatility period. Off course, it's not as if this rule is a magic wand. It will have to be proven on days of high volatility. Trailing during periods of high volatility is fraught - as I had cribbed after missing the 3 PM fall on expiry day. The other thing is that though I was on twitter all through the day, I was not looking at the news until quite late in the crash. I had no idea about China's retaliation to the US tariffs. So, going forward, I will try to be off random tweets during trading hours, and maybe follow CNBC on twitter. That would be good for my trading, and also good for my eyes.